Edition: These are very rare proofs. State I: 15 unsigned impressions (including 6 on this type of paper); State IX: 15 impressions, of which one was signed at the time and three later, before the plate was cut to the subject for the final state and inclusion in André Breton’s Anthologie de L’Humour Noir, which according to Baer was published in an unsigned edition of 17. Impressions: Very fine impressions. State I is in flawless condition. (Please note that the discontinuous line in State I is just a function of my poor photography skills and not the actual etching. I’ve included a supersized image of State I in its frame which looks somewhat better.) State IX is also in perfect condition apart from mild skinning [thinning] of the top of the back of the print from the removal of hinges. This is insignificant and cannot be seen from the front. “Finally, another chef-d’oeuvre, though not yet recognized as such, is the small portrait of Dora Maar which would be used later, in 1940, as the frontispiece for the édition de luxe of the Anthologie de l’humour noir by André Breton. 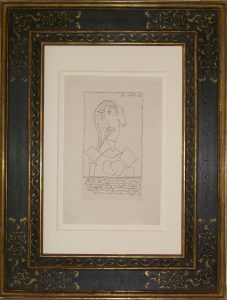 Once again, Picasso, who began with a line-etching of his subject, retouched his aquatint, layer by layer, taking it through eight states. In the 9th and 10th states, Lacourière traced a line in drypoint to show where the copperplate should be cut and then removed the written part of the plate. 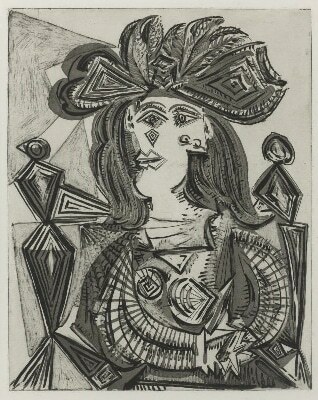 “Picasso took a great amount of trouble with that small plate. 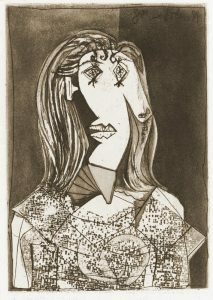 He used tarlatan to lay down his sugar-lift aquatint on the bodice of the dress, worked and worked again on the aquatint of the background, scraped, and reworked the portrait with the burin [engraving tool], then went back again to the aquatint of the background, deciding to make the right side of it darker than the left side. He then had the idea of lightly coloring the triangular neck with aquatint and finally used his burin again to perfect his work. 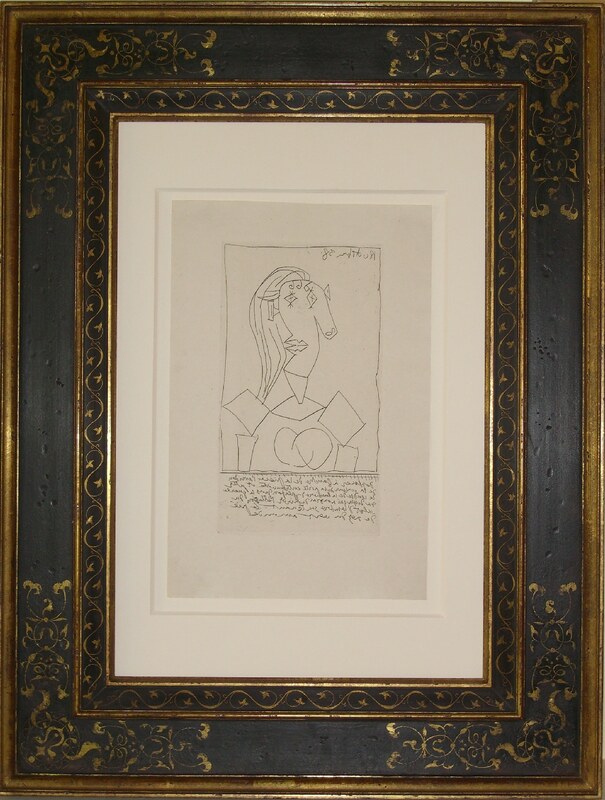 Despite its small size, the print is a highly successful and ‘monumental’ portrait. 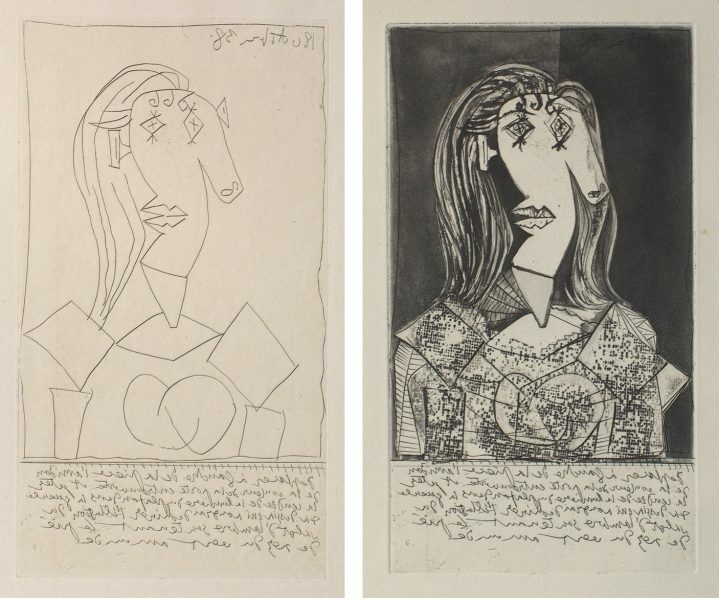 “Nearly every photograph of Pablo Picasso reveals a penetrating gaze—whether fixated on the camera, another person or a painting—his wide eyes appear to seek out each detail, seemingly absorbing every angle at once. His skill in relaying a multiplicity of perspectives to the picture plane yielded some of the most important images in the history of art and the late 1930s proved an era of particular political and creative significance for the artist. 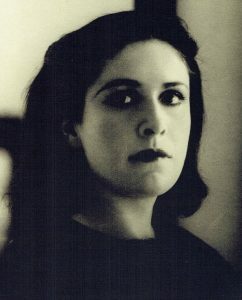 1937 saw the completion of Guernica and Sueño y Mentira di Franco (Dreams and Lies of Franco), the monumental mural and a pair of etchings, respectively, both of which expressed Picasso’s Republican sympathies and his outrage over the bloodshed of the Spanish Civil War. Appearing in both projects is an indelibly haunting image of a bereaving woman, weeping as she screams angrily skyward; it was this figure that most consumed Picasso and culminated in his pivotal etching La Femme Qui Pleure.